Another unique limited edition version of the 500 has been announced – the Fiat 500 BlackJack. Just 200 examples of the matt black supermini will be available when it goes on sale next week. 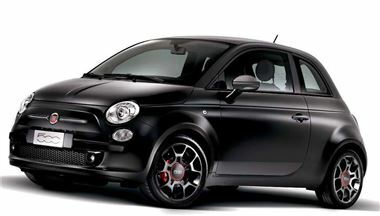 As with previous special edition 500 models, the BlackJack will initially be available on-line only at www.fiat.co.uk. The BlackJack name reinforces the character of this car: irreverent and mysterious. The 500 BlackJack is the first vehicle in this segment to offer the special paint, and is one of several exciting Fiat 500 limited editions being introduced this year. The 500 BlackJack – like all Fiat 500s – comes as standard with Fiat’s Start&Stop, which stops the engine automatically whenever traffic conditions bring the car to a complete halt, and restarts it immediately the driver wants to move off again. The new car costs £12,165 OTR (1.2) and £13,565 OTR (1.4).